Running an Instagram giveaway or contest is a great way to generate excitement and boost engagement. 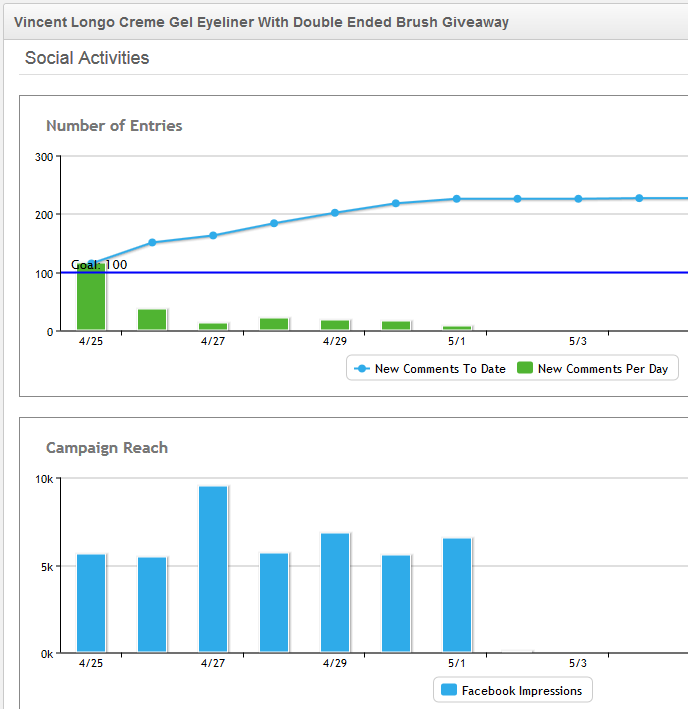 Using social media management software like Rignite can make your life easier tracking and analyzing your campaigns. Here’s how to run an Instagram giveaway or contest, with examples of how to do this with Rignite. The first step is to think of what would be a fun and engaging instagram giveaway or contest. A giveaway requires someone to take a simple action like Comment or Like your post to enter. 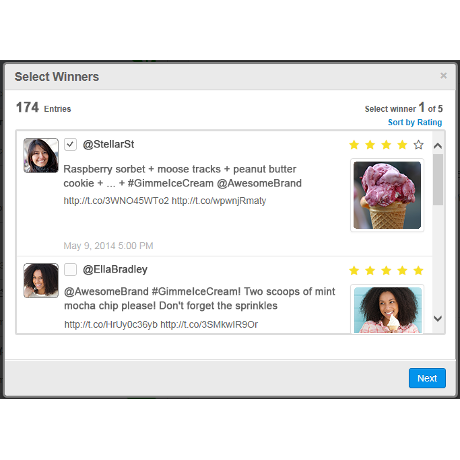 A contest requires more effort, such as posting a picture using your product, along with a #hashtag for tracking. Here’s an example to get your creative juices flowing. 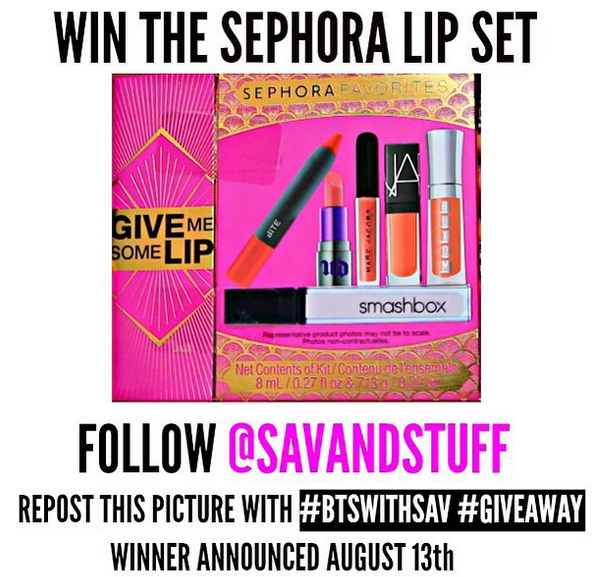 @SAVANDSTUFF ran this giveaway with a tempting prize and clear instructions for entering. You can see this Instagram giveaway just required the user to repost this picture from their own account along with the required hashtags. By requiring users to post from their own accounts, you’ll be reaching all the friends of each person who enters. It was also simple to enter because it didn’t require a new original photo, just a repost of an existing one. Notice how the entry instructions are part of the photo, making it effective when others post it. Once you’ve created your photo or graphic, post it to your Instagram account with clear instructions for entering. For more tips and examples see 5 Instagram Giveaway Tips. 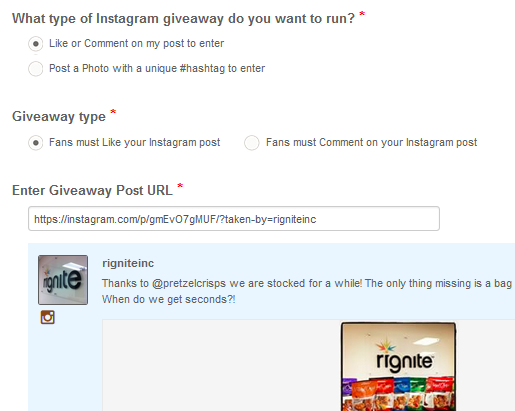 Learn how to to run an Instagram giveaway or contest using Rignite. We make it easy to track your Instagram campaigns. You’ll need to be able to easily track your entries and see how your posts are doing. Rignite makes this easy with a new Instagram campaign wizard. Just select the type of giveaway and enter the post URL for tracking. And don’t forget to cross promote your instagram campaign on other social networks such as Twitter and Facebook. You can post the URL to it manually on Twitter and Facebook. For Twitter, Rignite makes it easy to schedule dozens of posts for cross promotion. For tracking Instagram hashtag giveaways or contests, you’ll want to use a unique hashtag or combination or hashtags. Rignite makes it easy to test for this in the campaign wizard. Whether you’re using a campaigns tool or just tracking manually, be sure to figure out how you’ll track your entries. And don’t forget to cross promote on other social networks. Rignite is a software solution that makes it easy to run and track giveaway and contest campaigns on Instagram. 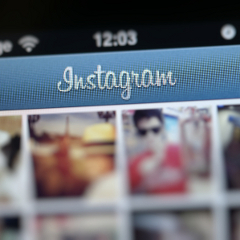 If you’ve created a compelling Instagram giveaway or contest, you’ll get great engagement. Engagement was great for the @savandstuff giveaway above, with over 1500 posts! Imagine all the exposure they received with these posts. The winners were contacted through a new Instagram post on @savandstuff (again, very clear about what the post was about! ), on time and with a comment on their original posts as well. If you’ve created a Rignite Campaign to track your Instagram giveaway or contest, you’ll be able to easily view all your entries and select a winner. Rignite will even find the winner’s entry and post a winner notification comment into their post to notify them for you. Easy as pie! You’ll also be able to see analytics as your campaign runs, including the number of entries as well as the performance of your Twitter cross promotion tweets. Instagram giveaways and contests can be tricky, especially when used with tools such as Rignite. Because original posts need to be made through the Instagram app, there’s an extra step when tracking campaigns in Rignite. But it’s worth it because of how easy it is to track entries, notify winners, and analyze results. We hope you’ve learned more about how to run an Instagram giveaway! Sam loves helping our users get the most out of Rignite and their social media. She blogs about ways to use Rignite to maximize your results from social media.